This product is a way to enhance students learning and get them to a deeper level of thinking. It will help them recognize tricks in questions and help their understanding of questions. 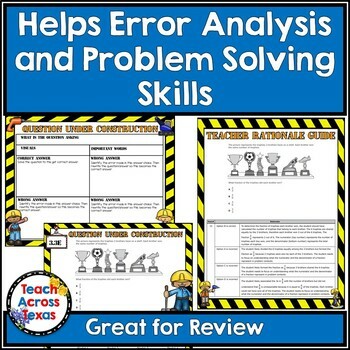 This activity was created from Lead4ward’s Fixer Upper. Students will get a 2018 released staar test question. Either the teacher can work with the students as a whole to get the correct answer or the teacher can have students solve for the correct answer. Once the teacher/students get the correct answer the students will then look at one or all of the wrong answers. They will then analyze the answer and the question and see what changes they can make to the question/answer/model to make their that answer choice be the correct answer. Most of the time students will have to change the wording of the problem. Students can then share with their group about their answer choice. I have used this in small group and whole group. We are even planning a construction day where the kids will wear construction hats a vests to make the activity a little more fun. Directions pg. 3-5: I have included three different directions each one being a little different. There are many ways this product could be used. Question Under Construction Template Option #1 pgs. 6-14: If you want your students to rewrite the word problem for every incorrect answer choice or have them record an their peers way to rewrite the word problem for each incorrect answer this is the template to use. I think it is important to let students choose their own ethnicity and gender so I have just changed the clip art figures on each one. Question Under Construction Template Option #1 pgs. 15-18: If you want your students to rewrite the word problem for just one incorrect answer this is the template to use. I have also included different ethnicity and genders. 2018 Released STAAR questions Task Cards pgs. 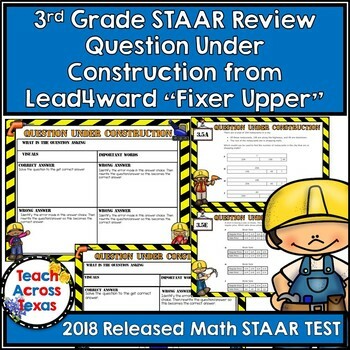 15-35: Theses are all the 2018 released staar test question in task card form with a construction theme. I like for each group to have their own copy of the question in front of them. You could also project a copy of it under the over head. Blank Slides pgs. 35-36: These are in case you want to use the template but put other questions on it. Teacher Answer Cards pgs. 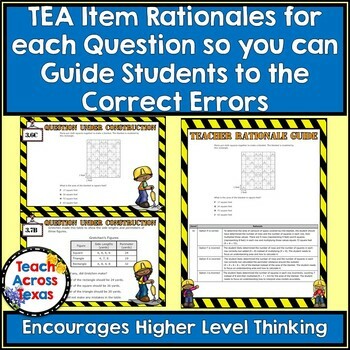 37-65: These pages have a copy of each question and the Rationales from TEA for each question. This will help you know what error was made with each answer choice and what is the correct answer. I read these and carry them around with me while I check. 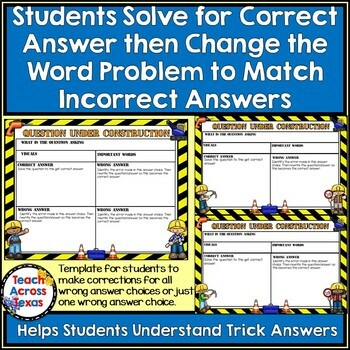 It helps me help or check the students when they are changing a the word problem to match a wrong answer. This also helps me help them identity the error. 1.Organize students into partners/small groups. 2.Provide each group an assessment item and each group member a Question under Construction Template. 3.Teacher will guide the students (whole group though the problem solving process to determine the correct answer. •What is the question about? •Visuals: What type of stimuli/visuals does the question provide? •Important Words: What words are important to the question? Students will then change the word problem/question or the answer chose or visual to make their assigned answer choice correct. 3.Have students solve the problem to determine the correct answer. Teacher will then check their answer before they move on to the next step. 5.Students will then change the word problem/question or the answer chose or visual to make their assigned answer choice correct. 4.Then each partner/small group will “construct” each incorrect answer choice. Be sure to follow me on the following sites for more fun things and great info to come! Teachers Pay Teachers: hit the green follow me button under my store name.